Invergordon a small town on the shores of Cromarty Firth in Highlands, Scotland, was once a booming town with a Naval base, an Aluminium melting plant and oil rigs fabrication/maintenance yard. However due to one reason or other these employment giving units gradually closed and by the end of 20th century the town had started decaying. 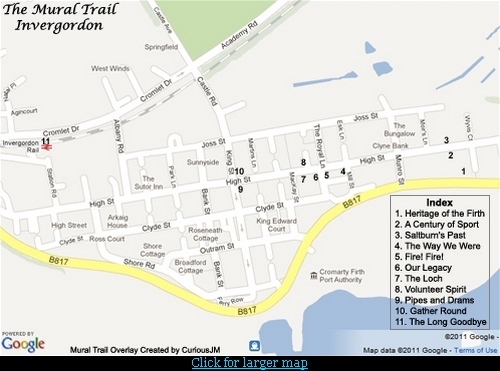 In January 2002 a voluntary group known as ‘Invergordon off the wall’ was set up suggest ways and means to regenerate the town. One of the projects taken up by this group was creation of an outdoor art gallery where in several murals, depicting the history and culture of the area were painted. The design and subject of each mural was decided by a community group who interacted with the professional artists engaged to create the art work. Most of the murals are located on the main “High Street” or on the streets just off the “High Street”. The entire route which is about half a mile long has been named ‘The Mural Trail’ and same was inaugurated in 2007 by Princess Royal (Princess Anne).
" 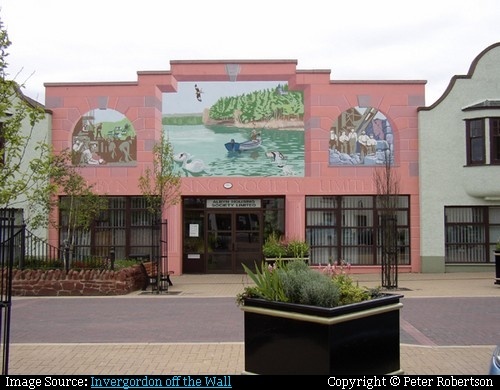 ..... 400,000 - 500,000 visitors per year come to view the murals….. Employment has increased due to the opening of 200 new businesses and morale and pride in their town has increased dramatically." The mural depicts three different aspects of quarrying around the town. The right panel shows the working of an old quarry, the left shows the stonemasons at work using the quarried stones and third panel depicts the nearby Balnagown Quarry which is now the artificial Kildary Loch. 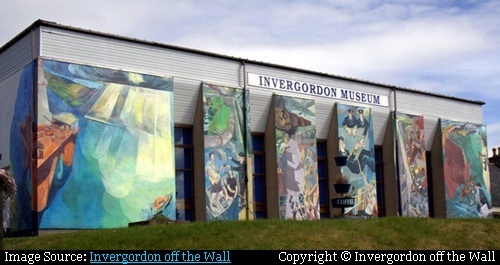 The mural shows two boats with the Invergordon Lifeboat Station. 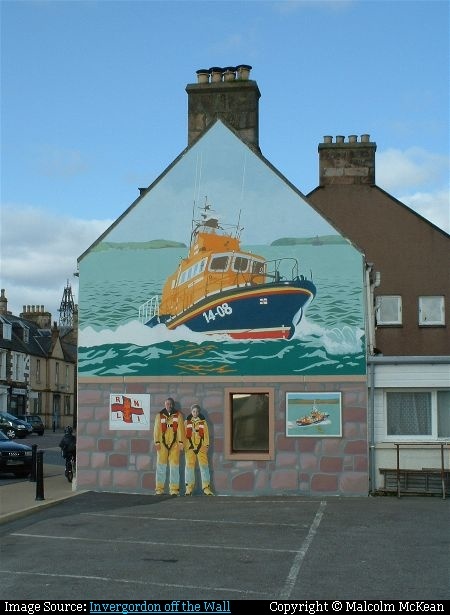 The mural was initially named as 'The Lifeboat' - The 'Douglas Aikman Smith' but later it was changed to Volunteer Spirit. The boat in the smaller poster is the Waveney Class Lifeboat, 'The White Rose of Yorkshire' which was in service from 1989 till 1996. The larger image shows the present Lifeboat 'Douglas Aikman Smith' which is in service since May 1996. 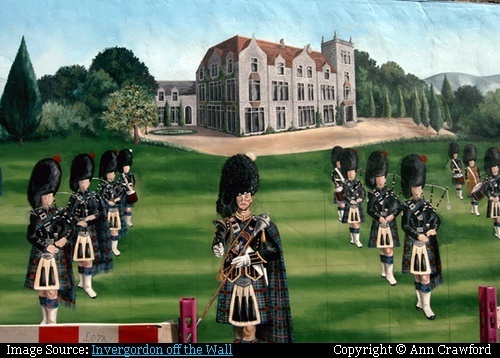 A tribute to the Invergordon Distillery Pipe Band. 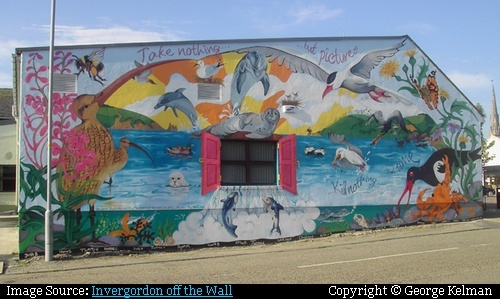 The Mural is a collection of six individual murals depicting the past history/heritage of the town. Panel 1 (L to R) - Tide Waders/Tide Waiters - depicts the local fishermen's wives, who braving the cold waters, used to board boats, which came in during high tide, and guided the travellers to the town. Panel 2 - The Natal Disaster - depicts the sinking of HMS Natal on 30th December 1915 with 421 listed losses. Panel 3 - The Invergordon Mutiny - depicts one of the few strikes in British history when about 1,000 sailors of the British Atlantic Fleet, went on strike on 15-16 September 1931. Panel 4 - Tank 13 - depicts bombing of the oil depot by a German Junkers 88 on 15th February 1941. Tank 13 was hit and was totally destroyed but fortunately there was no fire, although massive amount of oil was spilled and flowed down the nearby railway line. Panel 5 - The Smelter - The Poisoned Chalice - depicts the dashing of the hopes of the local populace by closure of the Aluminium smelting plant. Locating of the plant here in late 1960 had raised the hopes of the locals for good job opportunities, however the plant closed in 1981 with sacking of most of the employees. Panel 6 - The Oil Rig - depicts an oil rig which have almost disappeared from Invergordon, which was once the hub of oil rig repairs. 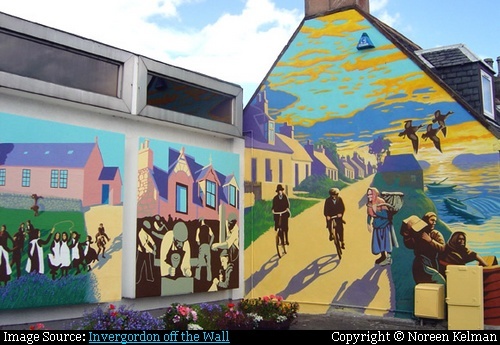 The mural illustrates Invergordon Highland Gathering - an sporting and cultural event which is held annually to promote sports, music and dancing etc. 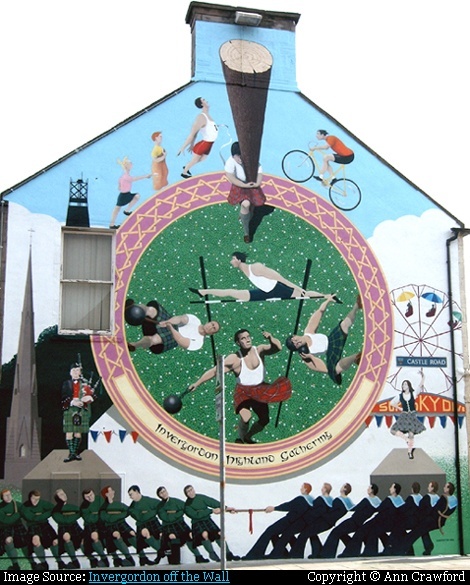 The athletics and other sport events which are held in the central arena of the town are shown in the circular ring of the Mural and the other outdoor events like cycle racing, children's egg and spoon race, sack race, dancing and piping etc. are depicted in the area outside the circular ring. The mural depicts the natural history of the Firth. The animals shown in the painting have been taken from Children's art competition and 24 winners from the local primary schools worked with the artist Tracey Shough to depict the fauna of the region - mainly the fishes and the birds found in and around Invergordon. 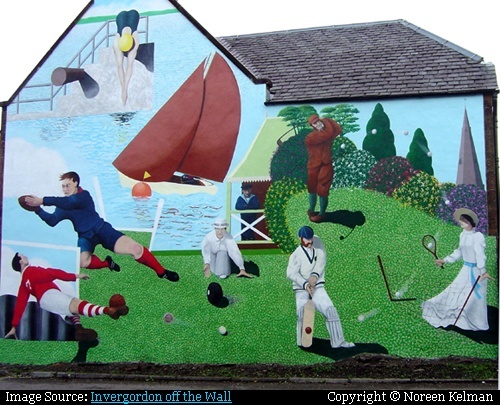 The mural illustrates various sports played in Invergordon during the past 100 years. 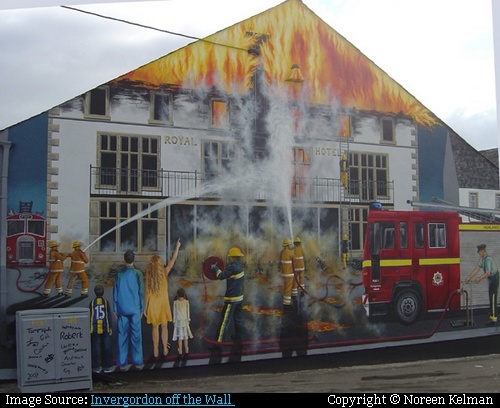 The mural depicts the tragic fire incidence of 3rd February 1972, which totally gutted Royal Hotel. The residents of Invergordon have very fond memories of the hotel, which had played a very important role in their lives had served as the venue for many weddings, birthdays and other social functions. Saltburn is a settlement/village adjoining Invergordon. 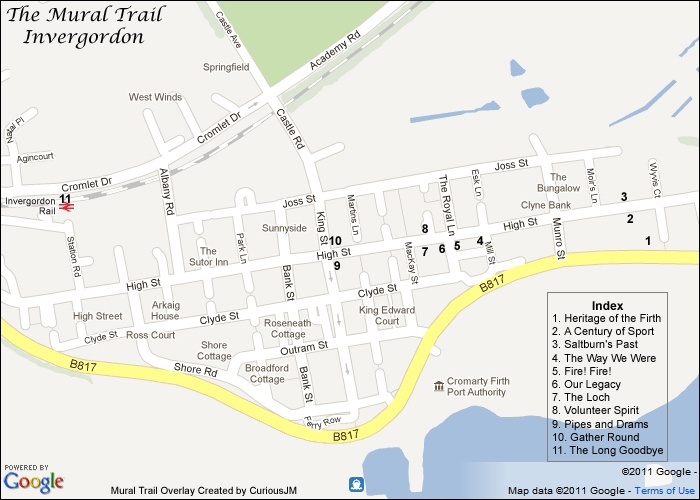 It has developed in the same manner as Invergordon and has close ties with Invergordon. The mural which consists of three panels, depicts Saltburn's past. First panel (left) shows the first Saltburn school which was built by the Saltburn stonemasons. The school is now village hall and all community activities take place here. The centre panel shows stone masons at work, The stone masons of Invergordon/Saltburn had played a leading role in building the New Town of Edinburgh. The last panel shows sunrise over the village. 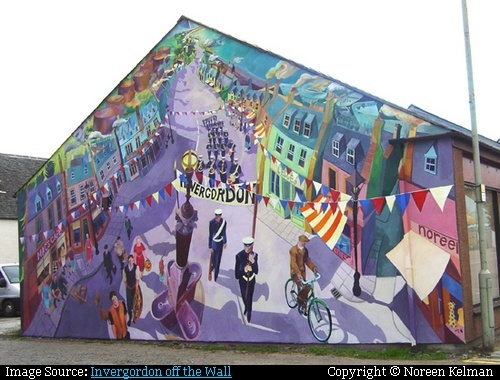 The mural portrays the past link of the town with the erstwhile Naval base and depicts the Royal Marine Band marching on the High Street. 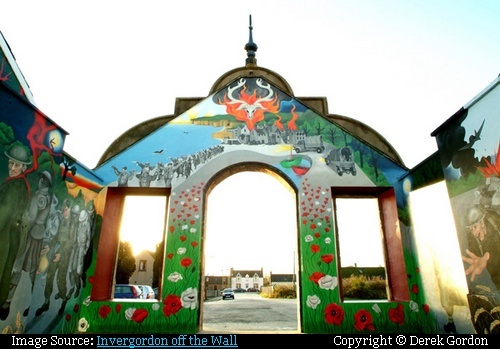 The mural depicts the story of 4th Battalion Seaforth Highlanders (51st Division) who departed for France in 1939 and most of them were taken prisoner in June 1940 by Rommel's army at St Valery en Caux. Two panels of the mural are on the interior walls of main platform and other two are on the passage way leading to the Station. The panels show their departure, the farewell by family, their life in the battlefield and ultimate capture. 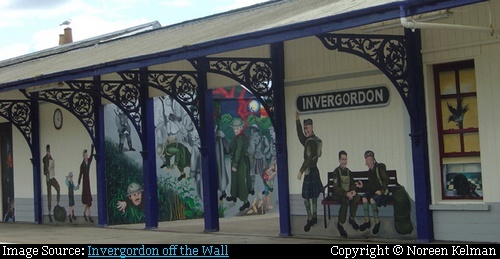 Credits: I am thankful to “Invergordon off the Wall” for permitting use of pictures from their website.